First trained by the Vikings for use in the hunt, the Goshawk is a valuable asset to any falconer’s experience. These fast, intelligent birds are highly ambitious in the hunt, but sadly, the beautiful Goshawk is disappearing, listed as threatened in the United States. Northern Goshawks love forests that are isolated from humans, and generally remain close to their nesting sites. A few North American groups migrate south for the winter. The Goshawk most often hunts songbirds, rabbits, and squirrels, catching its prey in a long, fast chase. These birds are often considered aggressive because they will chase prey even when they are not hungry, as though for the love of hunting itself. These birds are incredibly agile and can fly quickly and acrobatically even through thicker regions of the forest. conjunction with dogs, and Goshawks form great partnerships with their handlers, if treated well. The Goshawk is one of the most favored raptors in falconry due to their speed and their potential to hunt. The Goshawk is a classified as a short-wing, and the males weigh a little less than two pounds while females weigh just over two pounds. 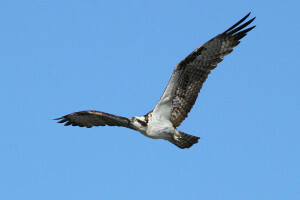 Males have a wingspan of about 39 inches, while female wingspans average 42 inches. 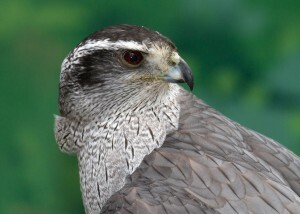 Adult Goshawks range in color from black to blue-gray, with white underparts. 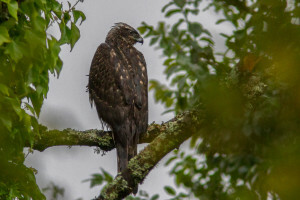 The backs, heads, and wingtops tend to be gray to dark gray to near black. Goshawks’ tails are gray, and their undersides are a lighter gray with gray stripes and white streaks. The tails of adults have dark stripes, usually three or four. The Goshawk has a very distinctive white band of feathers above their eyes, which are usually red-brown in adults and yellow in young birds. 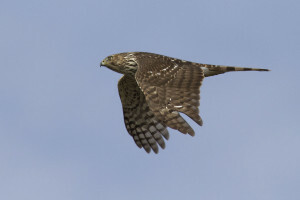 Juvenile Goshawks are much lighter than adults, with brown backs, heads, and wingtops and brown rather than gray streaks on their undersides. Goshawks range throughout the colder, mountainous forests of North America and Eurasia, though they have adapted to live in warmer climates like the Southern United States and Northern Mexico. Originally Goshawks were trained by Vikings to hunt with dogs and were traded to European nobles. Highly valued, Europeans considered the Goshawk to comport itself nobly and royally. The name derives from “goose-hawk”, which denoted the Goshawk’s some-time pursuit of geese. Today, Goshawks are still valued austringers’ birds, but due to loss of habitat, are listed as a threatened species. Goshawks have incredible potential as austringers’ birds because of their ambitious pursuit of prey, their speed and their intelligence. However, Goshawks are extremely proud and even perceived mistreatment will result in the bird’s nursing a grudge against its handler for days or even months. When handled correctly the Goshawk bonds well with its handler, and also hunts well with dogs. Goshawks should only be kept by experienced handlers, as their weight is difficult to control and Goshawks are prone to fits, which could end in death. In the United States, Goshawks may be owned only by falconers General class or above. Goshawks are so fast and enjoy tail-chasing prey so much that the handler may find it difficult to keep up with the birds. 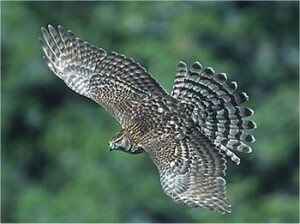 In addition, the Goshawk will become so intent on its prey that it may crash into fences or bushes, resulting in injury. Goshawks need special Bungee-leashes because they habitually bate while perched, which may injure their legs and tails. The most trainable Goshawks are hand-raised or caught during their first migration at one year of age. These highly intelligent birds respond especially well to lures and whistles and are comparable to Peregrine Falcons of the long-wing class. Male Goshawks build nests in the crotch of a tree, with sticks and line them with bark. They attract a mate by dancing through the air and performing acrobatic feats, while calling loudly. Goshawks mate for life and copulate many times a day. The female Goshawk lays two to five whitish eggs, one every two to three days, and will attack anything approaching, even humans! These eggs are incubated for about 36 to 40 days by both parents. After hatching, the female Goshawk remains with her babies at all times, and the male must bring all the family its food. When the hatchlings are 25 days old, the female will resume normal activity. Young Goshawks begin to fly at about 35 to 40 days, but will not be independent until they are 70 to 80 days old.